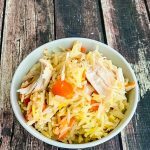 Chicken Curry Fried Rice is a healthy and delicious one pan meal that turns leftover chicken and leftover steamed brown rice into a deliciously healthy meal. 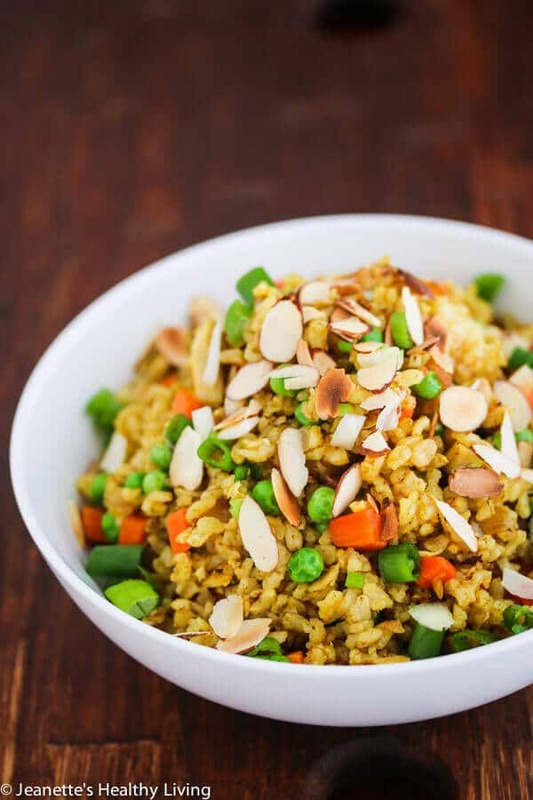 If you like curry, you will enjoy this easy curry fried rice dish. Well, even more reason for you to make your own fried rice at home. When it comes to fried rice, almost anything goes. The key is to chop everything into little bits, all about the same size. I usually use frozen peas, but carrots (you can use the frozen chopped ones), bell pepper, and cabbage are also nice in fried rice. I made this Chicken Curry Fried Rice for this month’s Recipe Redux theme: Two for One where we were challenged to come up with a new dish using leftovers from a favorite recipe already on our blog. 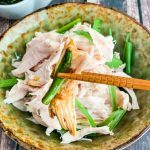 The leftover component of this dish featured is leftover chicken – I always seem to have leftover roast chicken or poached chicken (lately, I’ve been making Instant Pot Shredded Poached Chicken) in my fridge. 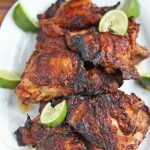 Sure, there’s always tacos, quesadillas and enchiladas, or chicken salad that could be made with leftover chicken. 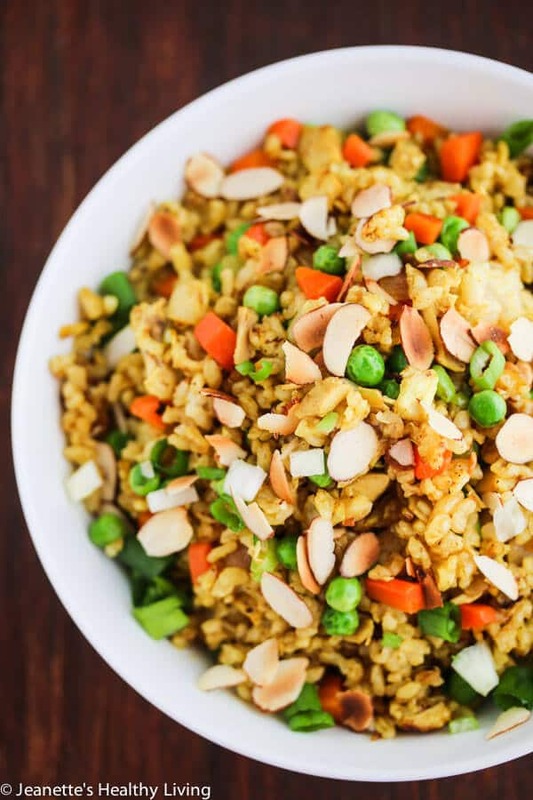 But, what about something a little different like Chicken Curry Fried Rice? 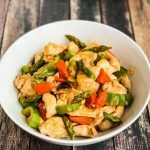 Curry powder and oyster sauce are the key flavor ingredients in this recipe. If you don’t have oyster sauce, you could certainly use soy sauce or fish sauce. 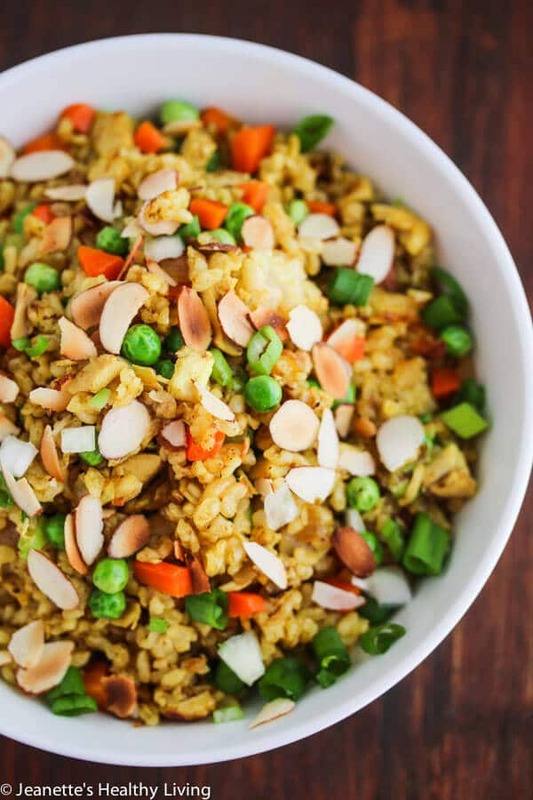 The idea of the toasted almonds on top came from my mom – she’s got a recipe for curry fried rice in her black binder too. What’s your favorite way to use up leftover chicken? Place carrots and water to just cover in a microwavable bowl; microwave on high for 3 minutes; drain. Alternatively, steam carrots on the stove or used leftover cooked carrots. Heat oil in a large pan; add onions and saute until translucent, about 2-3 minutes. Add curry powder and saute until fragrant, about 15-20 seconds. Add chicken, cooked brown rice and peas and toss well. Add oyster sauce and continue to toss until rice is hot. Scatter scallions and toasted almonds on top just before serving. 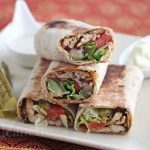 You make the simple everyday dishes look really appealing and moreish! 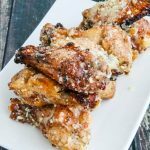 This is such a great way to use the leftover chicken! 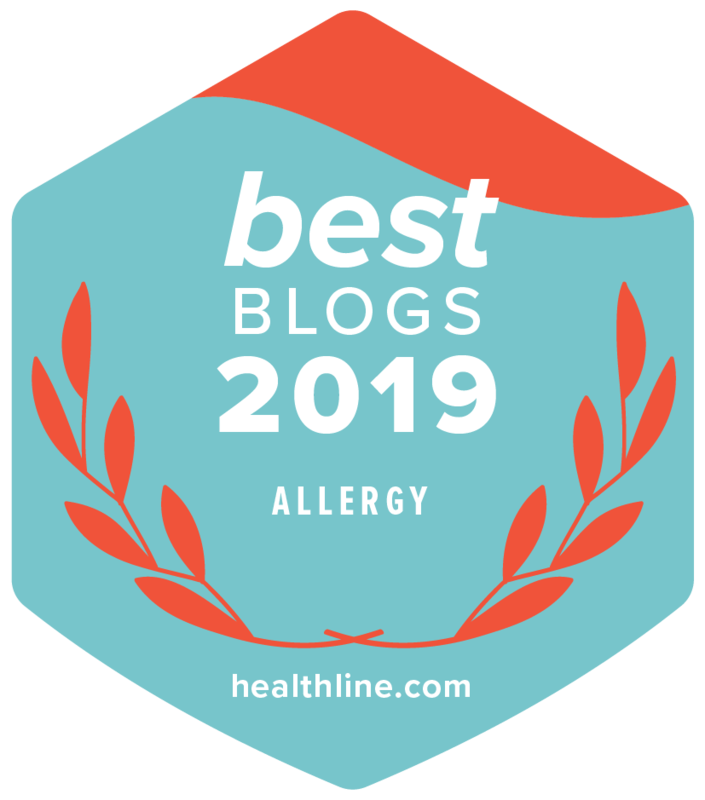 It looks amazing and the addition of toasted almonds is brilliant- way to go mom! Thanks Sonali – the almonds are definitely a nice addition. Nice recipe Jeanette. I love rice. Thank you and have a Wonderful Sunday! Thanks Liz – I hope you’re enjoying the weekend! 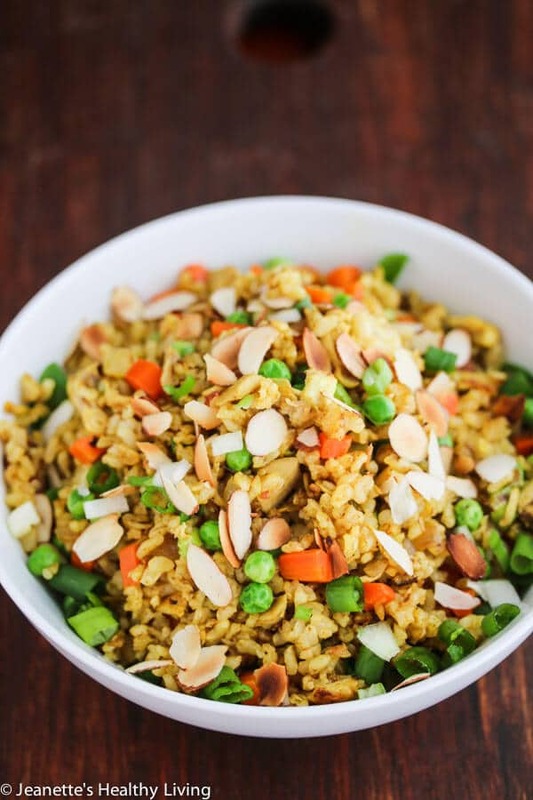 Curry fried rice looks amazing! I have actually been really into fried rice lately and can’t get over how easy it is to make at home. Definitely going to try this one out 🙂 Pinning! Bring on the leftovers! Curry is such an amazing flavor, can’t wait to try this delicious recipe! 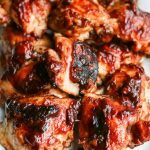 Farrah – I’m a big fan of curry chicken and anything curry! Yum! I love the idea of curried fried rice. 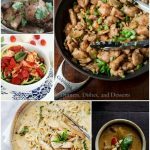 Great flavors and so easy! What a gorgeous and easy-looking recipe. Can’t wait to give it a try!! Thanks Liz – hope you enjoy this! 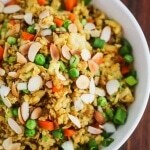 I don’t usually think to make fried rice at home, but I definitely need to change that and make this!! 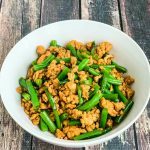 Deborah – so funny, I grew up with fried rice because it was an easy way to use up leftovers and tastes so good. I make it for my family now and everyone always loves it. Love the addition in curry in this! Love the curry! 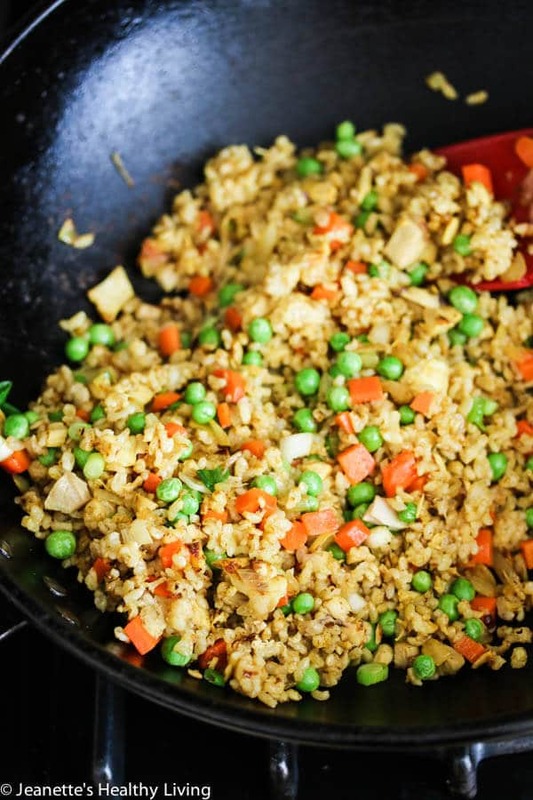 Great way to spruce up fried rice! OK-made this last night. Amazing! Added a touch of low sodium soy sauce and a little garlic powder-otherwise as stated. Really very good. 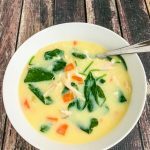 Sue – so glad you tried this and enjoyed it. Like the additions you made – thanks for sharing!